Earl’s All-You-Can-Eat is home away from home for this inseparable Plainview, Indiana, trio. Dubbed "The Supremes" by high school pals in the tumultuous 1960s, they weather life’s storms together for the next four decades. Now, during their most challenging year yet, dutiful, proud, and talented Clarice must struggle to keep up appearances as she deals with her husband’s humiliating infidelities. Beautiful, fragile Barbara Jean is rocked by the tragic reverberations of a youthful love affair. And fearless Odette engages in the most terrifying battle of her life while contending with the idea that she has inherited more than her broad frame from her notorious pot-smoking mother, Dora. Through marriage, children, happiness, and the blues, these strong, funny women gather each Sunday at the same table at Earl’s diner for delicious food, juicy gossip, occasional tears, and uproarious banter. With wit and love, style and sublime talent, Edward Kelsey Moore brings together four intertwined love stories, three devoted allies, and two sprightly earthbound spirits in a big-hearted debut novel that embraces the lives of people you will never forget. I'm so glad I downloaded The Supremes at Earl's All-You-Can-Eat (ok, I'm not crazy about the title.) It was an impulse download, but the sample had made me laugh out loud so I thought I'd give it a shot. Now that I've listened to it, I wish all of my impulses ended this well! The center and main narrator of the book is Odette - a middle-aged, black woman who lives in a small town in Indiana with her two best friends, her husband James, and a handful of lively ghosts - including Old Earl of the title. Odette was "born in a sycamore tree" and is rumored to be fearless. Time and time again, however, she proves she isn't just fearless, she's wise and filled with compassion. Also, because of the way the narrative shifts between the past and the present, I really felt like I've known these characters their whole lives, like I was a part of their circle. I don't want to give away the plot, but I can say that I will be recommending this to anyone who asks me "read anything good lately?"' and l will be looking for more from this author. Bravo! 21 sur 22 personne(s) ont trouvé cet avis utile. Would you listen to The Supremes at Earl's All-You-Can-Eat again? Why? This was the best book I've "read" in a very long time. I loved the characters -- warts and all -- and the story line. I am a dyed in the wool mystery reader, but books like this make me hang up my mystery category (for a while any way). You can always identify a truly great book when you, after a rough commute, continue to sit in your car, in your driveway, and listen! Listen to this book, you will be so glad you did! Both -- I laughed and cried -- enough said -- don't want to spoil it! Reminded me of Fried Green Tomatoes . The title of this one made me pass this one up a couple of times, but after reading a few reviews I decided to give it a chance, and boy am I glad I did!!! This was a great read!!! I enjoyed all the characters, this book bring out the laughter & the tears!!! Loved it!!! This book delivers an intriguing, satisfying read! As you are introduced to the characters in this book they became real and you start to pull for their success. The three women are each memorable in their own way but then so are the men. I found the ethereal characters who also inhabit the pages of this book to be endearing as well. It is intriguing that a male author delivers such a funny, touching novel that honestly deals with the universal types of challenges and twists that women face. I would love to hear him explain how he developed the characters and fine-tuned his plot line. He delivers a story that depicts both the pain and humor of lives fully lived. It was an absorbing and delightful read. The narration was excellent. This was a fantastic debut novel. The story revolves around 3 African-American women who became friends in childhood and stayed friends while growing up and growing older. The story goes back and forth between their childhood histories and their present day problems and every day situations. What most impressed me about "The Supremes at Earl's All-You-Can-Eat" was Moore's ability to tell a story through a woman's point of view. If I had known that the author was male, I would have guessed that a woman wrote the book. So, kudos goes to Moore for getting inside our female heads. The story is about love, reckoning with one's past and present, relationships (friendly and romantic) and the afterlife. All of this is told with humor. The narration was very good coming from both Ojo and D'Pella. I recommend this one highly! The best historic fiction since "The help"! What made the experience of listening to The Supremes at Earl's All-You-Can-Eat the most enjoyable? Due to my reduced vision Irely on audiobooks. Since I love books I usually buy several audibooks a week. Since audiobooks is a costly experience I am picky when it comes to how I use my credit. I found this by looking at what was trending in fiction. Thank PeterI did! I love stories in which you get to know the characters in a way that makes the story easy to follow. Stories about daring to be different has always inspired me. Colored ladies are historically very brave so this said:" I am credit proof " and it really is worthy your credit. To me, it had a dash of Gilmore girls meets "The help" and Bridget Jones. It is structured so perfectly: Past and pressent becomes one and you are drawn in. It deals with gossip, cancer, God Ghost, finding yourself and much more. Once you begin to listen you enter their diner hence the Gilmore girls reference. In this book you will discover how easy it can be to bound with fictional people. If you like "The help" Then you will most likely love this because of the strong stories and the differences which unites us. It spans over decades unlike "The help" making me closer to the characters. The way simple conversations between bestfriends was authentic enough to make time stand still. Strong ladies are so inspiring! Have you listened to any of Adenrele Ojo and Pamella D'Pella ’s other performances before? How does this one compare? No, this was a first. The way Odette was read annoyed me at first, because every sentence ended in the same tone. I grew to love it however since that voice managed to become Odette. The sad thing about this book? I did not want it to end. I love it and will "visit" my new friends by listening to it again and again. Odette's mother was my favorite. Not only was she incredibly funny, her view of the world from the other side offered an inspiring perspective on life. The scene when James is trying to style Odette's hair was touching. I found myself crying and laughing at the same time. I look forward to more books from this author. I was skeptical of a book about women, written by a man. But, he was able to portray all the characters with warmth, wit and wisdom. This is one book I'm sorry to finish because I'll miss the characters. Yes, it's timeless. The character and story are engaging. I laughed out loud, cried, and got lost in the stories of the three main characters. My favorite was Odette and her Mama...Odette's a strong, opinionated woman with no pretenses about who she is and what she's about. Also, her relationship with her mother in the story made me feel comforted that those we love are always with us. Her Mama was a hoot! Never heard these narrators before but they were great, the guys sounded like guys and the women like women. There were many memorable parts - two especially stood out, the one that made me cry like a baby was when Odette tells James her husband her prognosis and the other made me crack up at 3:30 in the morning (waking my husband), when Odette and her Mama go back to her childhood home to get the "medical relief" her mother was an expert in. Her Mama was a hilarious in that scene! The ending had several twists which were a pleasant surprises. The only downside was after all the great twists to tie up loose ends, the author prolonged the close of the story. Otherwise I'm so sad I finished the story so quickly...a good story is really hard to find. I can't wait for the author's next book! 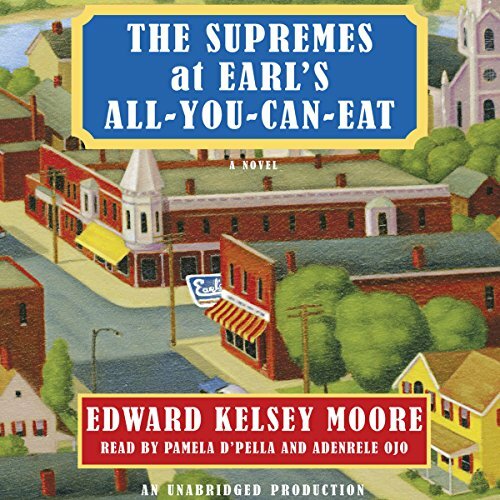 Would you consider the audio edition of The Supremes at Earl's All-You-Can-Eat to be better than the print version?